I was a bit worried that Andrew was being too ambitious when he chose The Family Meal cookbook by Ferran Adria – he of El Bulli fame. The book is called The Family Meal because it focuses on meals cooked for staff at the restaurant as opposed to those cooked for paying guests, which at least means the recipes are relatively simple. Andrew of course decided to pick out a menu for me to attempt as well. 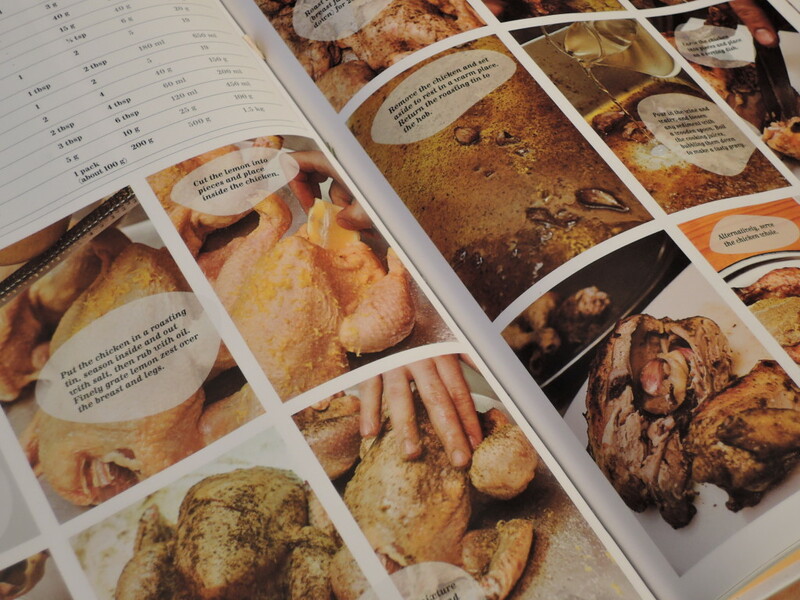 The book is split into various sections: an introduction of the basics you need in a kitchen including the equipment, plus basic recipes, then 31 different meals of a starter, main course and pudding. The ingredients are listed for each meal, divided into fresh, cupboard and freezer. You also have pictures of all the ingredients you will need and a timeline of how to make the entire meal, which would be very helpful for a novice cook. You also have pictures of every stage of the recipe so you can see exactly how you should chop the ham, stuff the chicken and slice the pineapple. Again, very useful for an inexperienced cook, and nice to demonstrate how a dish should be plated. As usual, I didn’t really want to follow the recipe exactly as … I mean really … cinnamon with peas? 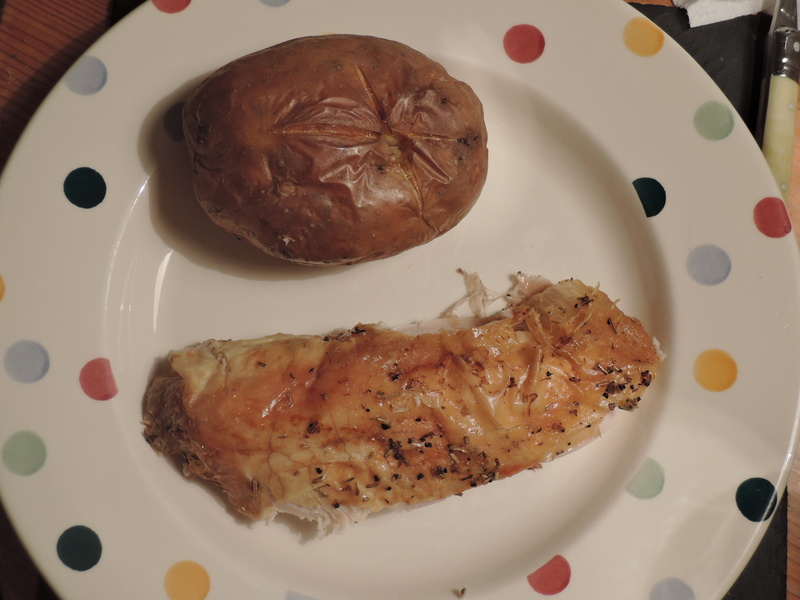 But as are the rules (so to speak) of this Cookbook Challenge I did follow each recipe to the letter (ish) and as with past experience, it was excellent. Clearly these chefs really do know what they are talking about! However, we were too full to manage pudding so didn’t bother with the pineapple. 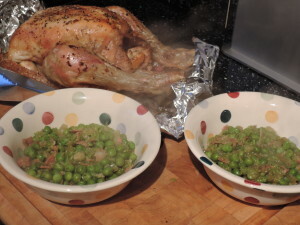 I will definitely be making both dishes again … especially the peas and cinnamon, which do work surprisingly well. Heat the oil in a saucepan and fry the onion for around 10 minutes until soft but not coloured. Add the chopped parma ham and gently fry for another 2 minutes until the ham is crispy and the fat is rendered. Add the frozen peas and cook for another 4 minutes, then add the cinnamon stick and mint and cover with a lid, simmering very gently for 5 minutes. 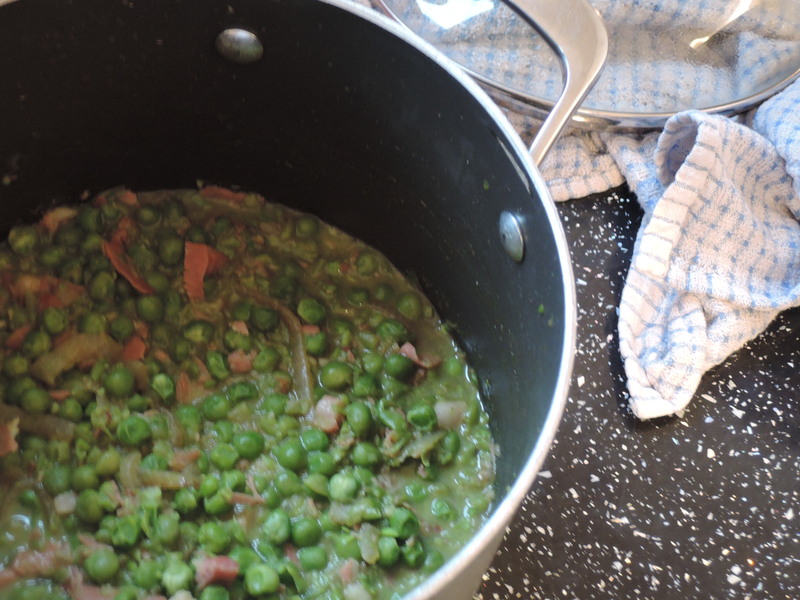 Add the stock and simmer for 5 more minutes with the lid on until the peas are tender. Using a stick blender blitz half the peas so that some of the mixture is blended and stir. Season to taste and serve in soup bowls. Pre-heat the oven to 220 degrees and prepare the chicken by snipping off the wing tips and the parson’s nose (I wouldn’t bother with this step next time). 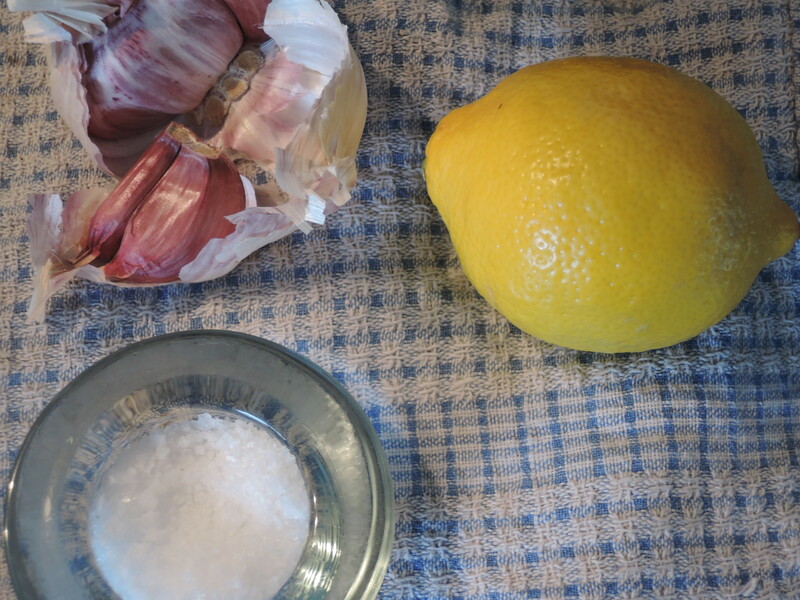 Season the chicken inside and out with salt, rub with oil and cover the skin with the zest and juice of the lemon. 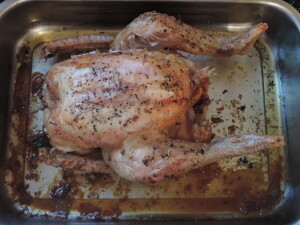 Mix together the rosemary, thyme and peppercorns together and cover the chicken with it. Stuff the inside of the chicken with the lemon (cut into quarters) and the unpeeled garlic cloves, then roast the chicken breast facing down for 25 minutes. 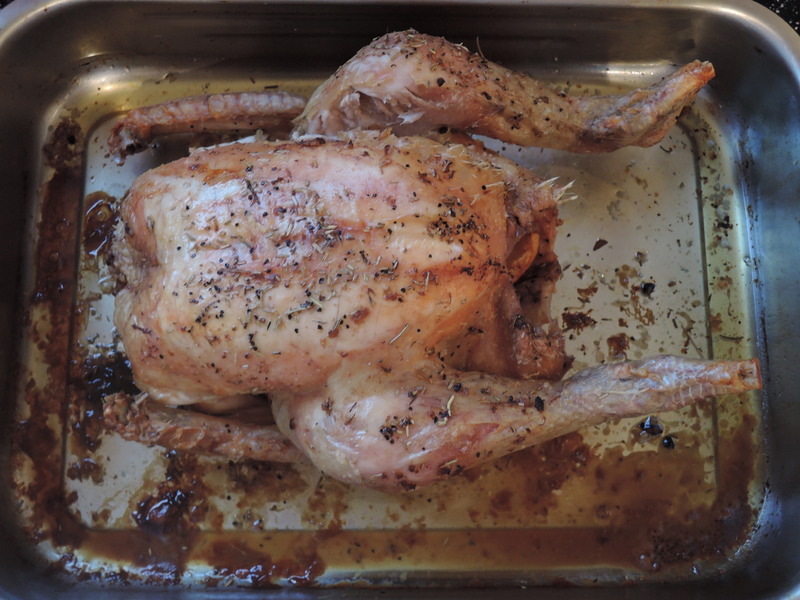 Remove the chicken when it is cooked and set it aside somewhere warm to rest while you make a gravy with the juices – put the roasting tin on the hob and pour on the water, stirring with a wooden spoon. Pour over the cooked chicken and serve (with potato straws, ie crisps, if you are Ferran … or with jacket potato if you are me). Find out about my previous Cookbook Challenges here.